For some of us creatives, it’s not easy getting motivated for a project. I spent several months in contemplation and lament before starting my commissioned Zombie Batman painting for a client. I mean, sure the house my parents and I lived in got foreclosed and we had to move out a week after our eviction notice, stay at a relative’s house, find an apartment and give our dog to my brother who lived 400 miles away, all during Thanksgiving week — but months passed, the dust eventually settled and, well, I continued to slack off. Why did it take me so long to start this project? Because I looked at it as WORK — backbreaking drudgery I didn’t want to approach. Even though my client gave me a down payment, he said, “No rush.” This totally messed me up. Having a concrete deadline is the number one motivator and I didn’t have one. So how then, was I able to finish the painting? Workshop nights with a fellow artist. Staring at your empty canvas, blank page, etc. and zoning out doesn’t help get the job done (well, maybe for some). Think about the big picture, so to speak. Ultimately, finishing this piece will allow you to develop your skills, beef up your portfolio and possibly teach you something when you run into conflicts along the way. Look at it as self-improvement. Plus, who doesn’t love the sense of accomplishment upon completing a daunting task? Feels good, man. 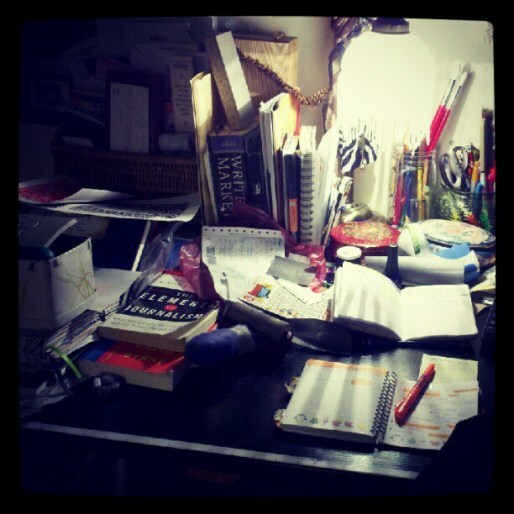 If you’re like me, you have a handful of projects going on at once, which makes for a cluttered desk. Take some time to organize your tools and clear a space to work. Tidy workspace, tidy mind. The last thing you need is to be stressed out. Take your goal and break it into smaller stages. Note how long you spend completing each one to efficiently manage your time. This way, you can determine how much work is left in the entire project and be motivated to finish each little task. Soon enough, you’ll get the job done. As mentioned above, I worked on my painting at a fellow artist’s house while she labored on her own projects. Once or twice a week, I put in 3-6 hours every workshop night over the course of a few months. Sometimes getting away from your comfort zone can help you think differently. Put yourself in an atmosphere of productivity and peer exchange — it can be super beneficial to completing your projects. Working alongside a friend will also make it enjoyable! Creatives draw inspiration from one another, so go take a peek at what else is out there. Read the newspaper and check out cool magazines and blogs in your field to get ideas. Visit museums, galleries, art walks and farmer’s markets for stimulation. Catch a concert, play or film screening. Attend lectures, workshops and debates. And most importantly, take part in meetups with fellow artisans near you. Mixing with those who have similar aims and issues is essential to your growth as a creative. See what your peers are up to, discuss your craft and maybe even set up collaborations and collectives. Mutual feedback and encouragement build momentum, so get out there! Concentration is vital to your productivity. Don’t give in to distractions. Give it at least an hour or two of deep, focused work before you take a break and check your email or Facebook. These kinds of distractions can drain your energy — and worse, your time. Have your goal in mind at all times, daily. Your craft is your passion; keep it that way! For a fresh perspective, try your hand at another creative discipline. For example, if most of the work you do is mental, create something with your hands. If you’re a visual artist, play around with simple music apps. Changing your medium activates new parts of your brain and keeps the creative spark burning. It’s not healthy to overwork yourself. You’ll get exhausted, lose momentum and worst of all, you’ll weaken your motivation. Once you’ve reached a certain amount of progress, reward yourself with a break — and celebrate with a treat! Breaks give you time to recharge and come back with a fresh eye, and incentives make your tasks worth it. I always find amazing movies and documentaries about interesting subjects and people in my Netflix queue. Artist biopics are always inspirational and motivate me to produce something. Nature and history documentaries usually spark something within. Hell, even a good drama can move you to create. Find something fascinating and emulate the images you see or recreate the emotions you feel. Artists and forward thinkers have been inspired by their surroundings for centuries. Bring a journal or sketchbook with you and visit a lush park or garden. Examine textures, shapes, structures, composition and colors. Go where people are and observe from a safe distance. Note interesting idiosyncrasies and conversation topics. How can you take what you see and hear and bring it into your own creations? If you study long enough, something will speak to you. If you have a suggestion to stay inspired, please comment below!